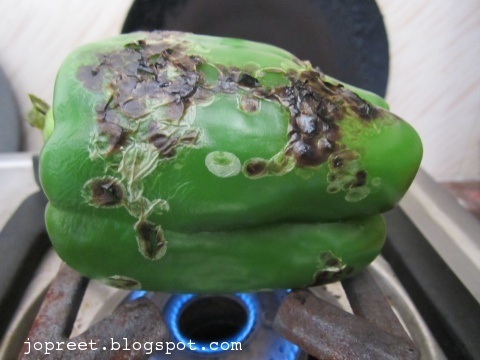 Wash the bell pepper and wipe it completely. With the help of metal tong hold the peppers directly over the stove flame. Keep it on low flame. It will take around 2 to 3 minutes to roast one side. Turn over the other sides carefully with the help of tong. Dont hold the tip of pepper since they may be soft after roasting and can break easily. Just hold the peppers in the middle. If the peppers are big, it may take around 10 mins to roast it completely. Once it is fully roasted, the skin will become black and shrinky. 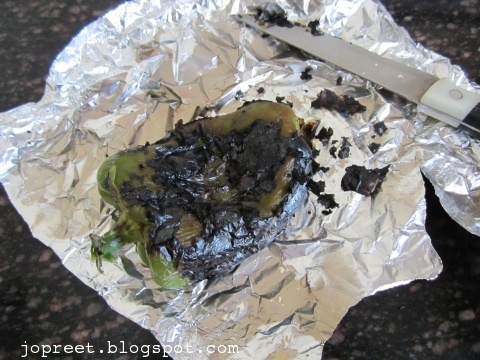 Now wrap the pepper in foil sheet and keep aside for 10 mins. Hold the tip of the pepper in one hand and peel off the loose skin using fingers or just peel with the help of sharp knife. Peel off gently and cut the upper part of the pepper and remove the seeds. It will come out easily. Throw the water if formed inside. You can slice the peppers and keep it refrigerated to use later in sandwich, salad or soups. I am using the roasted peppers to stuff the mutton mince. Heat oil in a pressure cooker and temper mustard seeds. Add chopped onions and curry leaves. Saute a while. Add chopped tomatoes and ginger-garlic paste. Mash the pulp. Add mutton mince, turmeric powder, red chili powder, coriander powder and salt to taste. Add 1/4 cup water and cook it covered for 5-6 whistles. Remove from the heat and allow to cool. Once pressure settles, transfer the mixture in a pan or kadhai. Add pepper powder and cook till the water is completely absorbed and masala becomes dry. Garnish with chopped coriander and remove from the heat. Allow to cool. Fill the roasted bell peppers with mutton mince masala and fill till the top. Serve it and enjoy. Looks so interesting and delicious.. I like capsicum in almost any form, nice recipe. Droolworthy stuffed capsicum, catchy stuffing. I live minced mutton and chicken love the taste of masala in those….stuffing in pepper is a gd idea…..
Hey Preethy,a very nice presentation there..Irresistible ! This is my favorite,u r making me hungry….lovely presentation dear. Can imagine the flavour and taste of this minced mutton masala dear. Mouthwatering..